Natalie Bartlett has spent the last 15 years of her life deeply immersed in land-based culture and has a passion for learning the music and craft of peoples around the world. She is a hide tanner, craftsperson, teacher and musician, and has been song catching and singing with the internationally acclaimed women’s vocal ensemble, KITKA, since 2014. 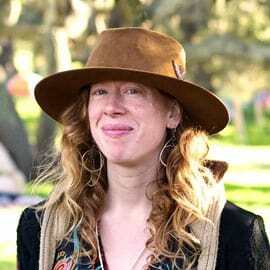 She is the director of the Quail Springs Wild Series as well as an on staff Naturalist at Manzanita School in Topanga, where she teaches ancestral arts and nature connection. As a musician, she has had the blessing of learning and singing with many living folk music masters from Serbia, Bulgaria, Ukraine, Russia, the Republic of Georgia and Iran – including Svetlana Spajic, Tzvetanka Varimezova, Mariana Sadovska, Basiani Ensemble, Carl Linich and Mahsa Vahdat. As a craftsperson and maker, she has taught classes at Buckeye Gathering, Spirit Weavers, the Gaia School of Healing of California, Acorn Gathering, The Oak Granary, Quail Springs and more. Natalie divides her time between the wild sagebrush deserts of Cuyama, the chaparral of Topanga Canyon and the Ventura Coast. She is a long-term Quail Springs land steward and mentor– combining her deep loves of music, culture, cooking, handwork and the natural world.